The link between equatorial Atlantic Ocean variability and the coastal region of Angola-Namibia is investigated at interannual time scales from 1998 to 2012. An index of equatorial Kelvin wave activity is defined based on Prediction and Research Moored Array in the Tropical Atlantic (PIRATA). Along the equator, results show a significant correlation between interannual PIRATA monthly dynamic height anomalies, altimetric monthly Sea Surface Height Anomalies (SSHA) and SSHA calculated with an Ocean Linear Model. This allows us to interpret PIRATA records in terms of equatorial Kelvin waves. Estimated phase speed of eastward propagations from PIRATA equatorial mooring remains in agreement with the linear theory, emphasizing the dominance of the second baroclinic mode. A proxy index based on linear ocean dynamics appears to be significantly more correlated with coastal variability than an index based on wind variability. 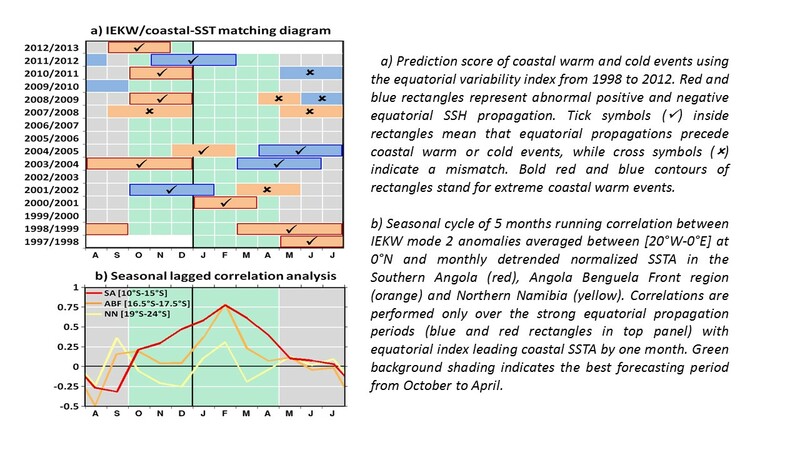 Results show a seasonal phasing, with significantly higher correlations between our equatorial index and coastal SSTA in October-April season. Collaborations: R.A Imbol Koungue (PhD candidate), S. Illig (IRD), M. Rouault (Nansen Tutu Centre).